The Governor of Imo State, Owelle Rochas Anayo Okorocha was among the 32-entourage who followed Buhari to the United States of America. Yesterday, the popular politician was spotted having a handshake with President Obama in the presence of Buhari. 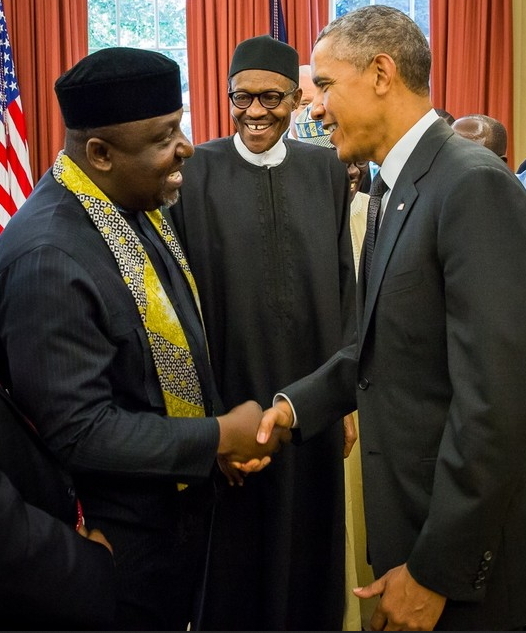 From the look on their faces, Okorocha must have said something funny that elicited a laugh in Buhari. WHEN WILL YOU ALSO INVITE PRESIDENT OF AMERICA TO NIGERIA…. BUHARI AND THE REST ARE DISGRACE TO NIGERIA IF THEY DON’T STOP THIS COMEDY!. NONSENCE. WHAT ARE THEY DOING IN US? #rapo they came there 2 relax their minds… Hahhahaha.